StateWays | www.stateways.com | March/April 2017 13 W ith hundreds of new product in- troductions hitting the market each year, how can members of the trade make sense of which prod- ucts to stock, which to drop and which to watch? This year's list of 136 Growth Brands in wine and spirits are a good place to start, as these brands have all managed to stand out in a crowded in- dustry and attract consum- ers' attention. We're proud to honor these 136 brands in four categories: Rising Stars, Fast Track Brands, Estab- lished Growth Brands and Come- back Brands. Their growth in 2016 was integral to the overall success of the beverage alcohol industry. We spoke to many of this year's winners about what made them successful, from activation programs and packaging to new introductions and line extensions. They serve as an example that hopefuls in the bever- age alcohol industry should closely follow and emulate. StateWays congratulates all 55 spirit and 81 wine winners, who will be honored during a reception at the Wine & Spirits Wholesalers Convention in Orlando on April 18. SELECTING THE WINNERS The Beverage Information & Insights Group (StateWays' parent company) determined this year's winners using the following criteria, based on brands' projected case sales for the 2016 calendar year: RISING STARS are less than fi ve years old and have exhibited growth during each year of their existence, reaching at least 20,000 nine-liter cases sold in 2016. FAST TRACK BRANDS have exceeded 100,000 nine-liter cases, with double-digit growth in each of the last four years. All Fast Track Brands are at least fi ve years old. 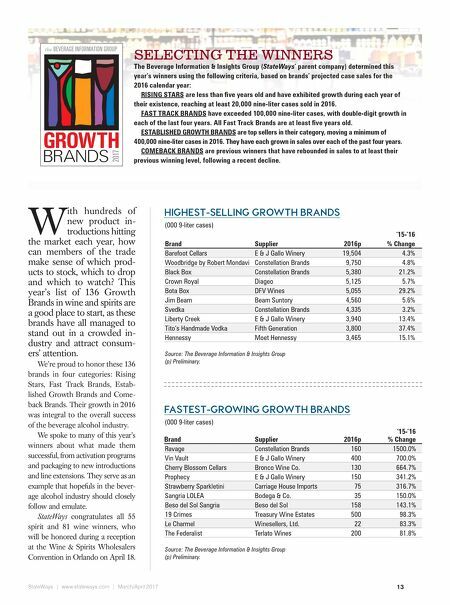 ESTABLISHED GROWTH BRANDS are top sellers in their category, moving a minimum of 400,000 nine-liter cases in 2016. They have each grown in sales over each of the past four years. COMEBACK BRANDS are previous winners that have rebounded in sales to at least their previous winning level, following a recent decline. HIGHEST-SELLING GROWTH BRANDS (000 9-liter cases) '15-'16 Brand Supplier 2016p % Change Barefoot Cellars E & J Gallo Winery 19,504 4.3% Woodbridge by Robert Mondavi Constellation Brands 9,750 4.8% Black Box Constellation Brands 5,380 21.2% Crown Royal Diageo 5,125 5.7% Bota Box DFV Wines 5,055 29.2% Jim Beam Beam Suntory 4,560 5.6% Svedka Constellation Brands 4,335 3.2% Liberty Creek E & J Gallo Winery 3,940 13.4% Tito's Handmade Vodka Fifth Generation 3,800 37.4% Hennessy Moet Hennessy 3,465 15.1% Source: The Beverage Information & Insights Group (p) Preliminary. 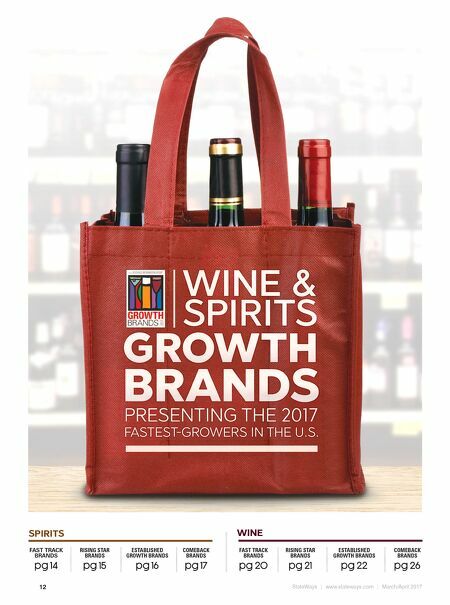 FASTEST-GROWING GROWTH BRANDS (000 9-liter cases) '15-'16 Brand Supplier 2016p % Change Ravage Constellation Brands 160 1500.0% Vin Vault E & J Gallo Winery 400 700.0% Cherry Blossom Cellars Bronco Wine Co. 130 664.7% Prophecy E & J Gallo Winery 150 341.2% Strawberry Sparkletini Carriage House Imports 75 316.7% Sangria LOLEA Bodega & Co. 35 150.0% Beso del Sol Sangria Beso del Sol 158 143.1% 19 Crimes Treasury Wine Estates 500 98.3% Le Charmel Winesellers, Ltd. 22 83.3% The Federalist Terlato Wines 200 81.8% Source: The Beverage Information & Insights Group (p) Preliminary.